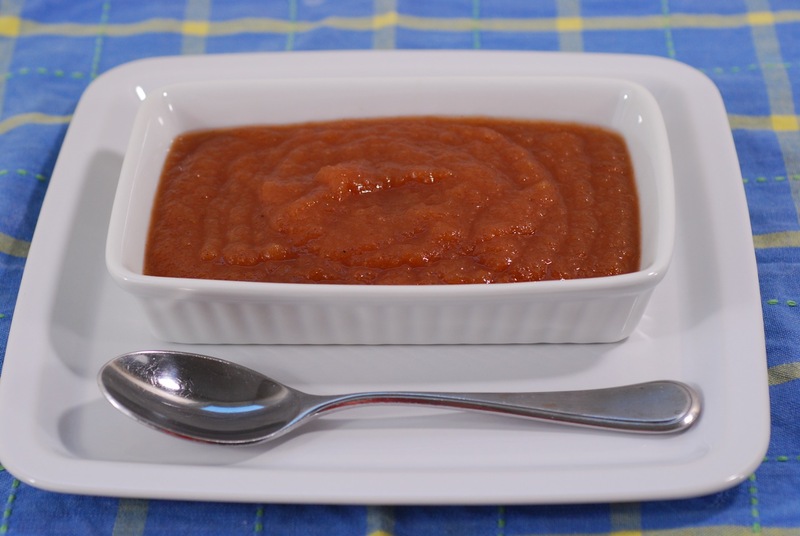 This is a thick, sweet cinnamon applesauce, almost like apple butter. I like to make it to cook with, and to serve with pork and charcuterie. It is thick enough to spread on toast, and is of course delicious by itself. 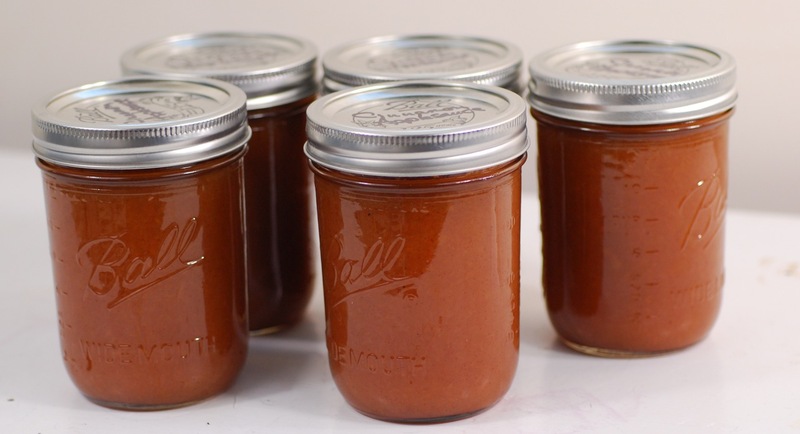 This applesauce was a blend of Cortland and Heritage apples from my trees, but you can make applesauce from most apples with good results. Softer apples, such as Macintosh, are preferable for applesauce, and many people like Rome, Jonathan, and Golden Delicious, which are usually easy to get. Wash, core, peel, and quarter apples. Put in a large, nonreactive pot. 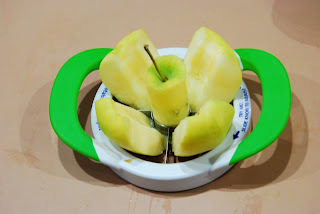 Alternate method: simply core and section apples with an apple coring tool, leaving skins on. 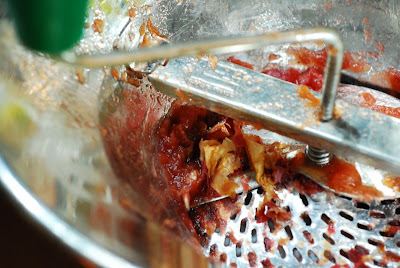 If the skins are red, this will result in a rosy color in the finished sauce. For every pound of prepared apples, add 1/2 cup water. 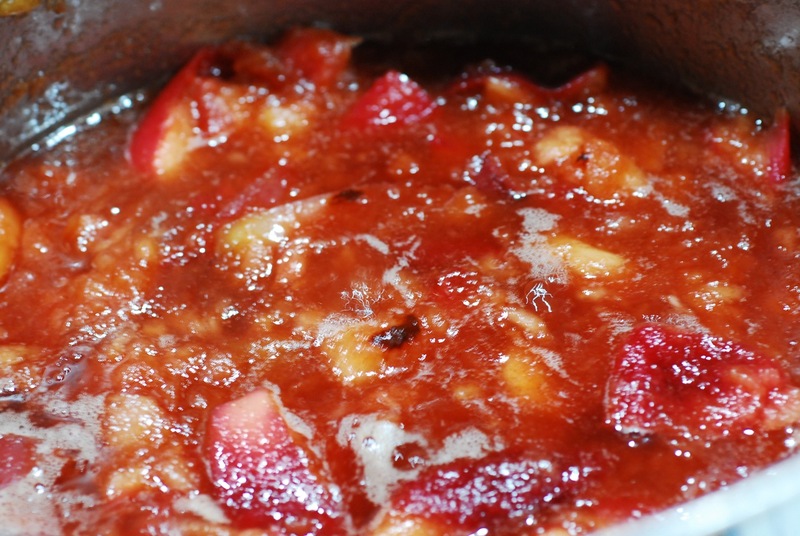 Simmer until apples are tender. Run through the food mill. If using unskinned apples, this will remove all skins. Put the resulting sauce back into the pot. Add the sugar and spices, then simmer slowly until the sauce rounds up slightly in a spoon. (If you go further, you will have apple butter). Taste and adjust sugar/spice if necessary. Boil a large pot of water, 6 inches deep. Sterilize canning jars in boiling water bath. Lift out with tongs onto clean towel. Pour some boiling water into a saucepan. Put the canning lids (not rings) into the hot water. 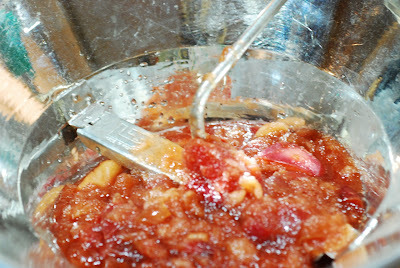 Ladle the hot applesauce into the jars, leaving 1/4-inch headspace. Put a hot canning lid on each jar. Then put the rings on, tightening down firmly (not as hard as you can, but tight). Put the jars back into the boiling water bath with tongs. The water should cover the tops of the jars. Bring back to a boil, and continue boiling for 15 minutes. Remove the jars, and tighten the rings down again a bit more. The jars will cool, and you will hear the "pop" as the lids draw a vacuum and make the seal. Mark the jars with the date, and description.